LEDUC — When Richard Cook visited his critically ill mother in the Leduc Community Hospital, there was little “breathing room”. That’s why the Cook family has gifted a total of $13,500 to the Black Gold Health Foundation since March 2014 in memory of their mother. Their donation — added to a fundraising tally of $200,000 started by the foundation back in the fall of 2011 — has resulted in renovations to four rooms and two lounges at the hospital. The rooms were transformed into suites that can accommodate one patient and up to four family members. New paint, new furniture, draperies, linens, flat-screen TVs and wall art have created more comfortable spaces, with an atmosphere of family-centred care, to give families the privacy and togetherness they need at critical life moments. Teresa Mark-Redhead, manager of inpatient service at Leduc Community Hospital, says she’s thrilled with the new spaces. “People have a heightened sense of awareness when faced with critical times in their lives,” says Mark-Redhead, a registered nurse. Brenda Dodman, past Board Chair of the Black Gold Health Foundation, says she’s also pleased with the renovations. For more information, visit www.blackgoldhealthfoundation.com. Pictured: Mary Cook, left, shown here with daughter Wendy Cook, spent a week in the Leduc Community Hospital after she lapsed into a coma. 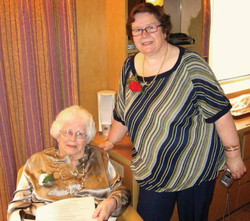 In appreciation of the care she received, her family has donated a total of $13,500 to help refurbish four family suites and two patient lounges. Photo courtesy Richard Cook.